MEXICO CITY, Apr 17 2012 (IPS) - Biodiversity and small and medium farms are threatened in Mexico by the looming approval of a reform of the law on plant varieties that will extend patent rights over seeds, activists and experts warn. The amendment, of the federal law on plant varieties in effect since 1996, was approved by the Senate in November and is now making its way through the lower house of Congress. “They are trying to expand privatisation in this important sector, as part of an offensive backed by transnational corporations to give more rights to breeders (of plant varieties), which are mainly these big companies,” Adela San Vicente, the head of Semillas de Vida (Seeds of Life), a local NGO, told IPS. The reform, defended by the government of conservative President Felipe Calderón, would cover all plant material, including harvest products, and would introduce the definition of “essentially derived varieties”, used to protect genetically modified organisms (GMOs). In addition, it extends the period of protection for breeders of plant varieties from 15 to 25 years. One of the risks posed by the reform is that small farmers who receive and grow hybrid seeds without authorisation could face legal action. 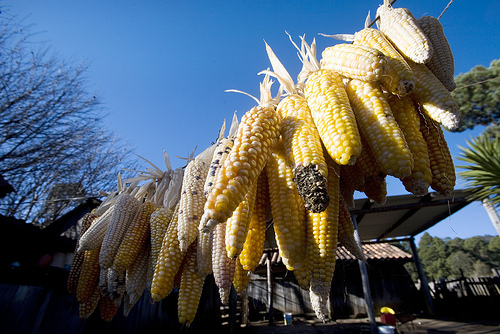 “They are paving the way for the industry to charge patent rights if, for example, native maize is contaminated by transgenic crops, because the native maize would contain the genes of the GMO,” Alejandro Espinosa, a researcher in the maize programme at Mexico’s National Institute of Forestry, Agricultural and Livestock Research (INIFAP), told IPS. “It would be the last nail in the coffin for the Mexican countryside,” complained the scientist, who has developed more than 30 hybrid species at INIFAP and at least a dozen at the National Autonomous University of Mexico, for production by small companies and distribution at the local level. The amendment would bring Mexico’s legislation into line with the International Convention for the Protection of New Varieties of Plants, as revised in 1991. The Convention, which is monitored by the International Union for the Protection of New Varieties of Plants (UPOV), was adopted in 1961 and revised in 1972, 1978 and 1991. Mexico, which joined UPOV in 1978, currently follows the standards outlined by the Convention in that year’s revision. The UPOV system of plant variety protection provides international recognition of the rights of breeders of new varieties that are distinct, sufficiently homogeneous and stable, according to the criteria outlined by the intergovernmental accord. It also provides double protection, for both patents and plant variety rights. The Geneva-based UPOV’s mission is “to provide and promote an effective system of plant variety protection, with the aim of encouraging the development of new varieties of plants, for the benefit of society,” according to its web site. The 1991 revision of the Convention, which entered into force in 1998, protects Canadian, U.S. and EU property rights, and introduced the novel feature of recognising rights over new genetic traits – an open concession to GMOs. More than 250,000 tonnes of seeds are produced annually in Mexico, according to the National Service of Seed Inspection and Certification (SNICS), the government agency that oversees some 55,000 hectares of land where seeds for about two dozen crops are produced. A collective of researchers and NGOs has urged legislators to halt the reform, and to subject it to an open debate with all concerned sectors, including small and medium farmers, who it will affect the most. In this country of 112 million people, Latin America’s second-largest economy, there are approximately five million peasant farmer families, according to official figures. With the projected reform, SNICS would have the authority to impose fines or even block land use for infractions of patents and plant breeders’ rights. SNICS has already registered more than 150 breeders from over 20 countries, involving at least 100 plant species. Of that total, 26 percent are ornamental plants, and the rest are agricultural or forestry species. The countries of Latin America have filed fewer than 1,000 applications for plant breeders’ rights with UPOV. Meanwhile, the No Patents on Seeds global coalition of NGOs reports that since 1996, farm-saved or “informal seeds” have been on the decline, while industrial seeds are expanding. “Hundreds and hundreds of varieties are needed to ensure the sustainability of improved and native seeds,” INIFAP’s Espinosa said. “Advances in their yields are environmentally-friendly, because they are genes from the species themselves. “The improvements are made with the best plants, according to the environment. It’s what farmers have done for decades,” he said. But Mexico is increasingly lax in protecting that system. The government-run national seed production company, PRONASE, has been in the process of liquidation since the early 2000s, which has left the sector in the hands of private Mexican and foreign companies. In addition, the 2005 Genetically Modified Organisms Biosafety Law and the 2007 Law on the Production, Certification and Trade of Seeds have given industry more and more maneuvering room. The National Catalogue of Plant Varieties, updated by SNICS in December, contains 1,827 species, most of which are different kinds of maize, beans, sorghum, wheat and potatoes. Public research institutes and food corporations like the U.S.-based Monsanto and Pioneer have registered their varieties in the catalogue. Inclusion in that list is the first requisite for registration in a seed production programme. There are at least 180 commonly used plant varieties in Mexico, such as the nopal cactus fruit, güisquil or pear squash, avocado, and tomato. SNICS defends patents on seeds, arguing that they protect the genetic patrimony and facilitate access to plant material, which depends on the fair distribution of economic benefits, while respecting special rules for endemic species, preventing the plunder of resources and biopiracy, and strengthening institutional capacity. Farmers have always known how to breed the best varieties. Corporations as well as government institutes are only there to fulfil their own vested interests.We need to destroy these monsters before they destroy this planet! Come’on!